Welcome to the RDP website. Ryecorn digital publishing was set up to provide a publishing platform for the Kindle e-Magazines and novellas developed under the Ryecorn brand. This provides a professional feel to the e-books, with all the benefits of umbrella branding. Our latest project is an e-book we have created to raise funds for the RSPCA. Thank you for expressing an interest in Paws For Thought: 27 Tail Thumping stories. There's a wide variety of fiction in Paws For Thought. We have twist in tales, ghost stories and crime, right through to the light- hearted, cheerful and uplifting. It's worth mentioning that we've included work from several well known writers, whose stories are regularly featured in UK magazines. Writers retain copyright of their work. Ryecorn Digital Publishing was set up as a hobby to epublish our non-profit fiction emagazine, Kishboo (2014 – 2016) which was run and owned by a husband and wife team from West Yorkshire, England. In March 2017, we decided to take some of the stories from across all seven of the Kishboo emagazines in order to compile an ebook of short stories. We also asked members of an online group, Fiction Addiction, to donate some stories too. A HUGE THANK you to all the writers who have donated stories to this anthology. We hope you enjoy reading Paws For Thought. If you have, please consider posting a brief review on Amazon. 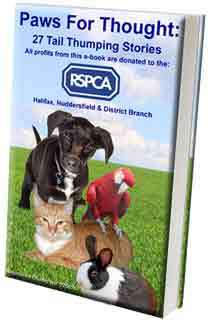 Thank you for supporting the RSPCA Halifax, Huddersfield & District Branch. You can now download apps for any mobile device that will allow you to read Kindle books on your mobile phone or tablet.